Current program - Tuggerah Lakes U3A Inc. The following special interest groups meet regularly during term time. Most classes may be joined at any time, however for some groups (marked with an asterisk below), it is necessary to contact the course secretary before joining the group. Creative Writing*: Secretary: Pam McGlinn, ph: 4390 2451. Please contact Pam in advance if you would like to join the group and try your hand at writing. Venue: Toukley. Dates and time: see Newsletter. Readers' Group: Secretary: Margareta Tauni, ph: 4332 5408. Choose your own book to talk about, relating to the theme, genre or author set for the particular day. Give Margareta a ring for a list of topics, or just pop in to any class and listen to what we talk about. Venue: The Entrance Leagues Club (Tigers), Bay Village Rd, Bateau Bay. Dates and time: see Newsletter. Cryptic Crosswords: Not only do we learn the tricks of doing cryptic crosswords, but we have lots of fun doing so. Bookings not required. Come along and see if this is for you. Venue: The Greens, The Entrance. Secretary: Betty Siegman, ph: 4332 0870. Dates and time: see Newsletter. Keeping The Marbles Rolling*: Improve your mental skills by following Peter Beale's program designed to exercise seven major mental functions, conducted in a non-competitive environment. New attendees must pay $25 for course materials (continuers pay $10). Course Secretary: Rhonda MacDiarmid, ph: 4332 2300. Venue: The Greens, The Entrance. Dates and times: see Newsletter. Music Appreciation: A varied program of mostly classics, some well known and loved, and some we have not heard before. Secretary: Betty Siegman, ph: 4332 0870. Venue: Berkeley Vale: Dates and time: see Newsletter. My Memoirs: If you have been thinking of recording some of your memories for your family, why not make a start NOW? Bring a pen or pencil along, and some paper, or a notebook. Write down your thoughts, short stories, or parts of your life. There'll be tips and guidance offered.. Secretary: John Haydon, ph: 0403 797 585. Venue: The Entrance Leagues Club (Tigers), Bay Village Rd, Bateau Bay : Dates and time: see Newsletter. Movie Appreciation*: Secretary: John Richards, ph: 4388 4945. Please book with John before attending, as places are limited. Venue: Chittaway Bay. Dates and time: see Newsletter. Mah Jong*: Mah Jong is an interesting game. Please contact the secretary if you wish to join the group. Secretary: Rhonda MacDiarmid; ph: 4332 2300. Venue: Killarney Vale. Dates and time: see Newsletter. Play Reading*: A popular group. There are many plays ready to go, and lots of fun to be had. Men are always needed, so if your desire is to play the dashing hero or the dastardly villain, here is your chance! Please contact Christine before your first attendance. Leader: Christine Kilner, ph: 4399 2748. Venue: The Entrance Community Centre. Dates and times: see Newsletter. Conversations: In small groups, we reminisce and share experiences, ideas, and opinions as prompted by short video talks. Secretary: Betty Siegman, ph: 4332 0870. Venue: The Entrance Community Centre. Dates and time: see Newsletter. The special interest groups are very popular with their members. The Creative Writing group is particularly keen, and may write poems, essays, diaries, or a variety of other subjects. Cryptic Crosswords require only general knowledge - you will be taught how to analyse the clues. The Readers' Group has a devoted group of followers - a particular genre of novel, or author, or perhaps non fiction style of writing is chosen, and each person selects their own book. Term 2 starts on Monday 29 April 2019 and ends on Friday 5 July 2019. 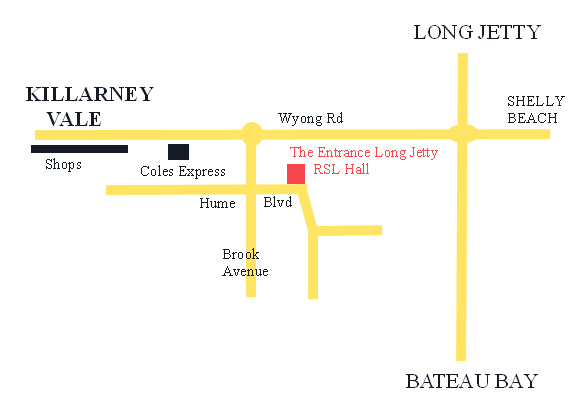 "Broken Hill - The History Of Its Legendary Pubs And Breweries"
"Our Local Coastline - Part 2"
These talks will be presented on Friday mornings (10 a.m. - 12 noon) at TELJ RSL Hall, Hume Boulevard (near Brooke Ave) Killarney Vale (see map for location). Before the beginning of each Term, our Newsletter is sent to each member containing full details of the current Term programme and a detailed timetable. The Newsletter provides more information about the talks, courses and special interest groups, and about any outings that have been arranged. If you would like a paper copy of the newsletter to be posted to you, please phone the Newsletter Editor, Betty Siegman on 02 4332 0870. © 2019 Tuggerah Lakes U3A Inc.